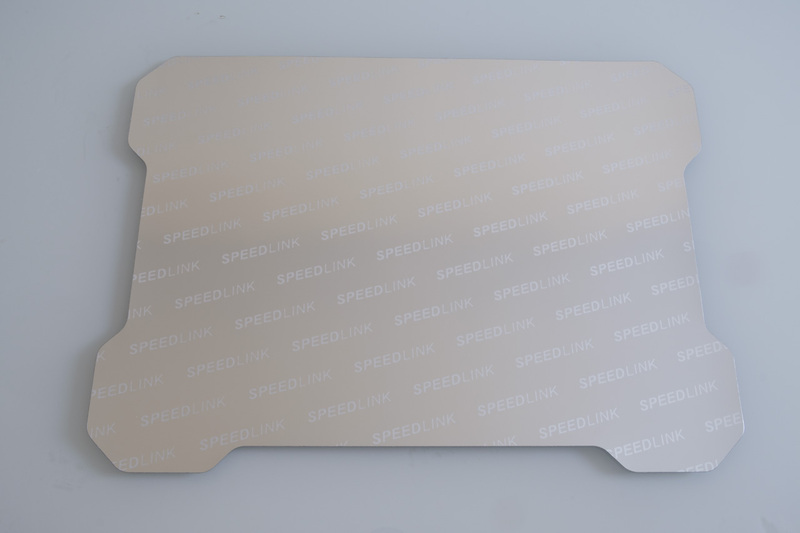 Today we’re looking at Speedlink’s super thin mousepad, the CRIPT. 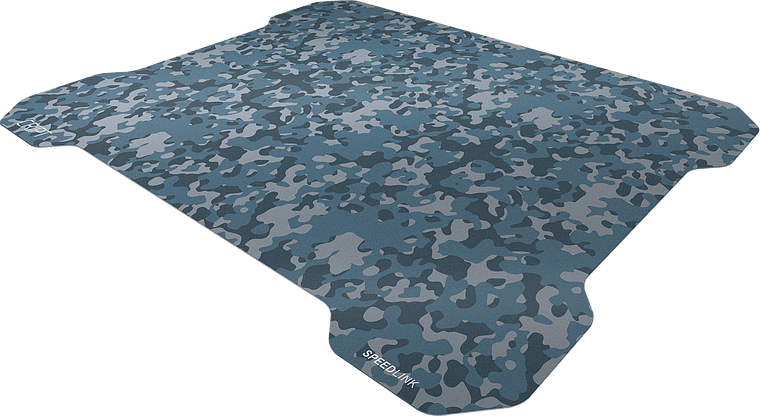 This particular mousepad is decorated with a fetching blue / green camouflage, allowing it to stand out proudly on desks of uniform colours. Let’s get right into the review! 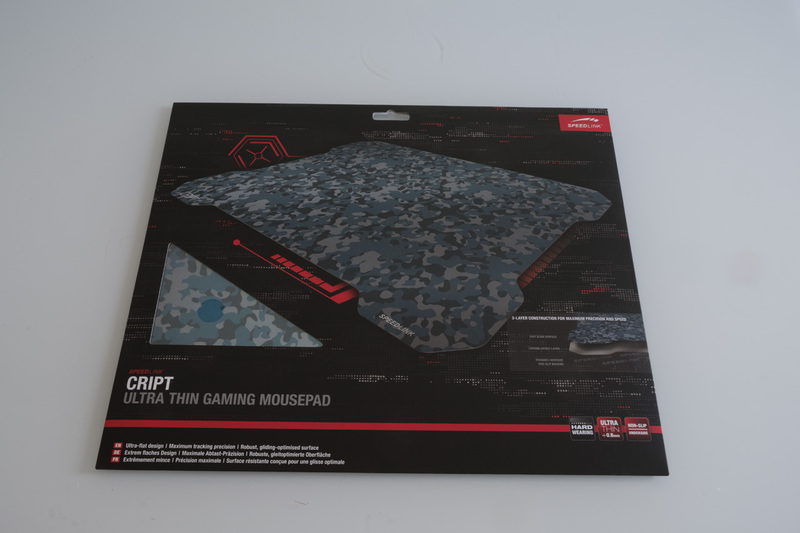 The CRIPT is packed flat, unlike most mousepads on the market. Inside the box, you’ll find the mousepad, plus the necessary charging cables, instruciton manual and other accessories. Just kidding, it’s a mousepad; there’s no thing else inside. The CRIPT has a not-quite-square shape, listed on the product page as an ‘ergonomic pro-gamer shape’. I must admit that I haven’t ever seen any progamers shaped like this, but perhaps they are out there somewhere. I personally prefer the classic rectangle for gaming mousepads, but this is cool too, I guess. The size of the mousepad is 380 x 280 millimetres, which works out to 15 inches by 11 inches in Freedom Units™. It’s quite thin as the name promises, measuring just 0.8 millimetres. Given that most cloth mousepads are between two and five millimetres thick, that’s a significant reduction. The bottom of the mousepad has a repeating Speedlink pattern that provides some grip, without leaving any adhesive residue. I used the CRIPT for one week in order to give it a fair test. Gaming in Counter-Strike, Overwatch and Battle Brothers took up the majority of my testing time, although I also slipped in a few writing and editing assignments here and there. In general, I found the mousepad to be quite slick, with a lower coefficient of friction than the cloth HyperX mousepad I’ve been using for the past few months. Sometimes, that meant my aim in Counter-Strike or Overwatch was a little shaky. However, this improved with time. Having a slick mousepad is not a good or bad thing necessarily; it comes down to personal preference. 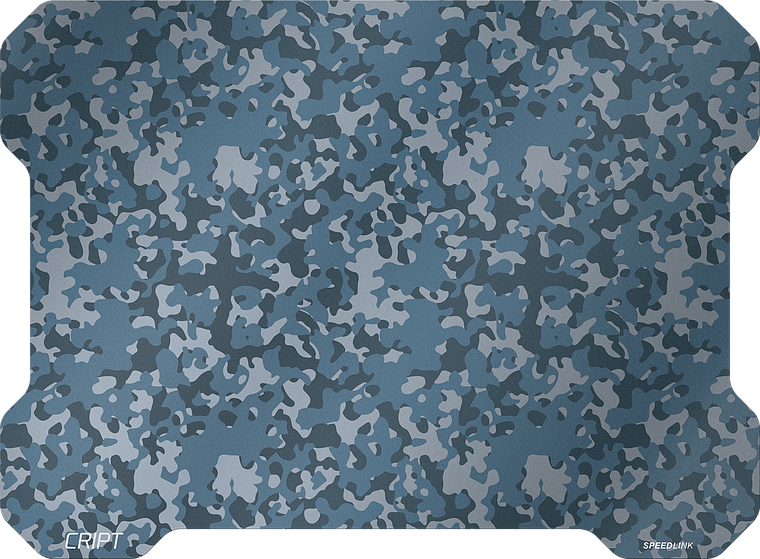 If you prefer to be able to move your mouse more quickly, then a slicker mousepad like the CRIPT is a good idea, but if accuracy and precision is your goal then a slightly coarser surface with higher friction can make things easier. The CRIPT mousepad is being billed as good for ‘ultra high-sense and low-sense gaming’, but its modest 380mm x 280mm size makes use at very low sensitivities difficult. I’d recommend something a little larger, perhaps 500mm x 400mm, for users of DPIs between 400 and 800. I found that the thinness of the mousepad had some benefits in my testing. Firstly, it’s very easy to transport this mousepad to a LAN; it will fit inside almost all backpacks or duffel bags without problems. As it isn’t rolled, you don’t have to deal with kinks once you reach your destination; just place it on the desk and go. The minimal dimensions also mean that the mousepad blends into the rest of your desk more easily; there’s no lip or lump that marks the boundary between mousepad and desk. However, that does make it a little easier to accidentally push off the mousepad during frantic moments. One unusual thing I noticed is that the mousepad makes a bit of noise if you brush your hand or mouse over it, presumably as the seal between the desk and the mousepad is disturbed. It’s not loud or annoying, but it’s definitely odd compared to silent cloth mousepads. 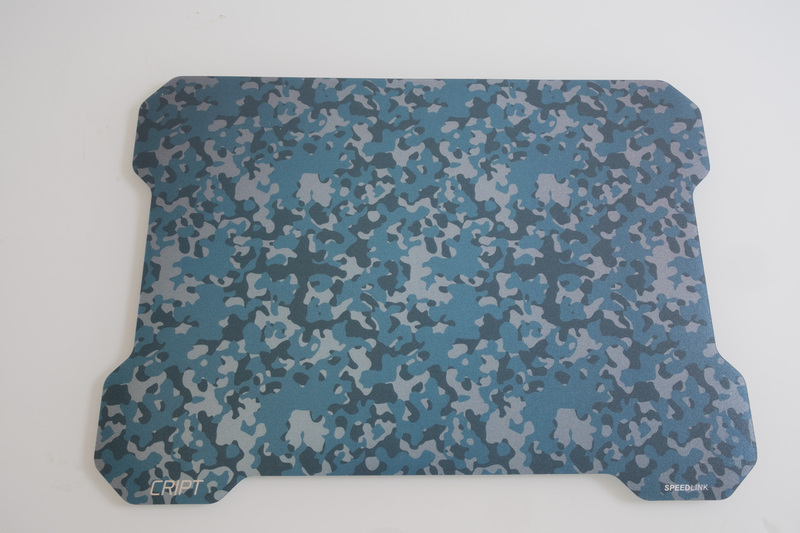 The Speedlink CRIPT is a pretty slick mousepad with a hip camouflage design. It should suit medium and high-sensitivity gamers well, but low-DPI players might prefer a larger or coarser mousepad.